Sailing yacht HANSEAT IV is a 24.60m (80’9”) sailing yacht built by Austral yachts in 2001, as the result of careful planning and design by the famous design studio of Bill Dixon Yacht Design. 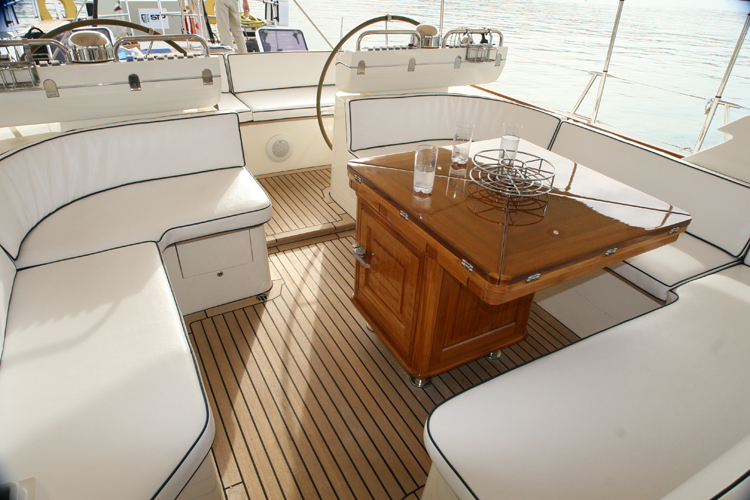 S/Y HANSEAT IV boasts a classic appearance and a beautiful sheer line. The HANSEAT IV sailing yacht was created to be an uncompromisingly comfortable, easy to handle, safe and well performing sloop of the highest standard in respect to construction, materials and equipment. Germanischer Lloyd attested her to the highest class for hull, materials, engine spaces and mast/rigging. An extremely rigid hull construction with a 45 mm red cedar core and multiple inner and outer layer of epoxy GRP was chosen for HANSEAT IV. The outer layer was additionally fitted with 1,5 layers of Kevlar for improved impact resistance. Structural members such as keelson, engine beds and mast step were constructed in solid mahogany and epoxy GRP coated. Yacht HANSEAT IV’s interior is tasteful and classic panelled in American Cherry with maroon leather couches in the upper saloon and fabrics from France and the USA in the lower saloon. 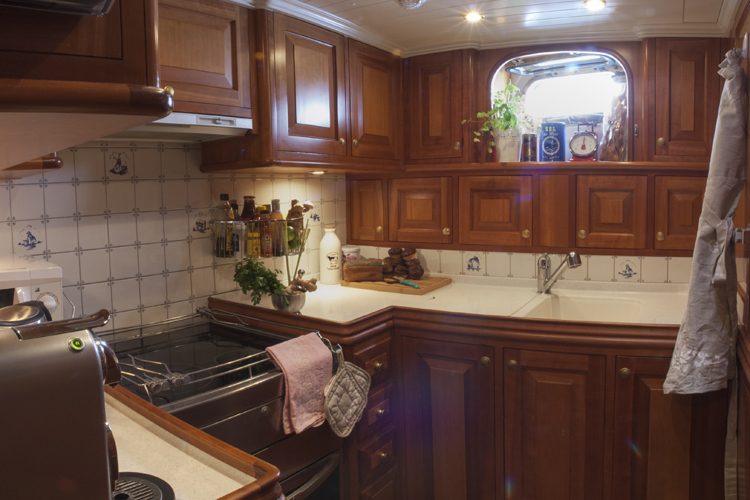 The lower or dining saloon offers a cosy space to read or entertain friends or dine in style. The upper salon is also a comfortable area, perfect for enjoying the surrounding environment while under sail. 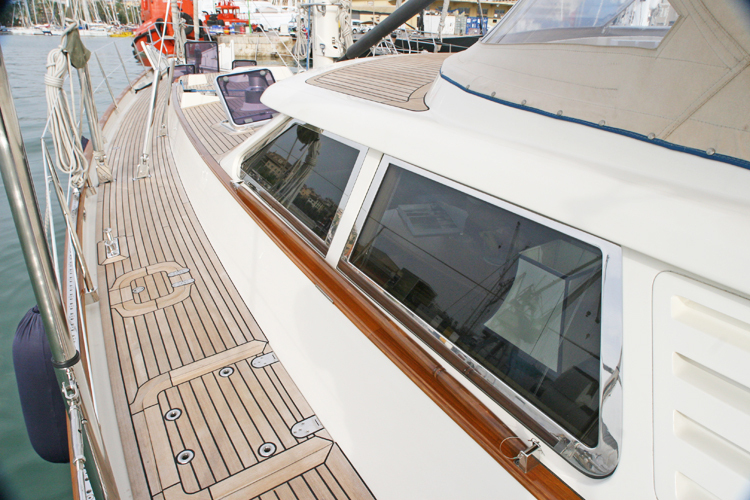 The Burmese teak decks provides safe working space and storage-lockers and also houses the two reel winches for the main halyard and the staysail sheet. A spacious cockpit provides ample space to work with no ropes or winches interfering. Two wheels and two consoles provide excellent stations to navigate from with all instruments available in multiple numbers. 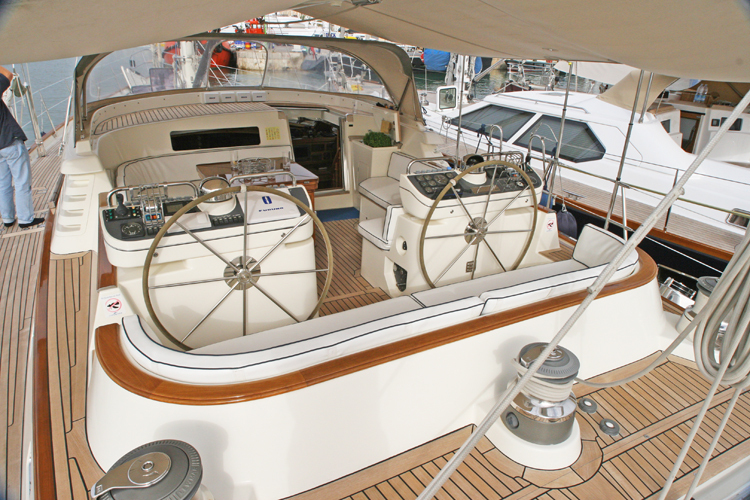 The obvious place onboard to enjoy in the Mediterranean climate is S/Y HANSEAT IV’s spacious cockpit. The cockpit table allows 8 charter guests to dine under a sunroof, which furls out of the boom and is fixed to the telescopic stanchions of the sea railing. A cockpit fridge ensures drinks are always chilled and ready at hand. 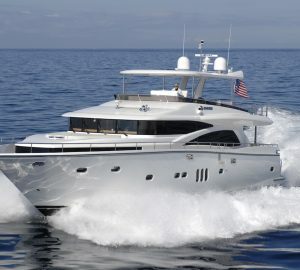 A huge aft deck allows space to sunbathe or fish with two fishing rods. At night a swim with the surrounding water being illuminated by underwater lights gives an extra thrill to the HANSEAT IV charter guests. The HANSEAT IV yacht is easy to manoeuvre in the narrowest marinas thanks to a variable controllable pitch propeller and a 45 Hp Bowthruster. To motor over longer distance is powerful, yet smooth with noise levels in owner’s cabin below 45 db and in saloons around 55 db. Cruising speed at economical consumption is around 9.5 kn and 3900 ltr of fuel give a considerable range under engine of about 2500 nm. Sailing yacht HANSEAT IV has a mainsail, which is operated by the Leisure Furl patented carbon boom and can be hoisted hydraulically either by 24 V battery power or by PTO connected to the main engine in a matter of only 1.5 minutes. The fully battened sail with a considerable broach shows an excellent shape even in reefed condition. Reefing is merely a matter of pushing a button. The Genoa, also furled by the push of a button, just like the self-tacking staysail are efficient and provide an excellent forward trust to the yacht. The rainbow-coloured APC (MPS) of 406 sqm is stowed in a sleeve, which makes hoisting an easy exercise. Charter yacht Hanseat IV is an admirable yacht offering a pleasant and safe sailing in all conditions. 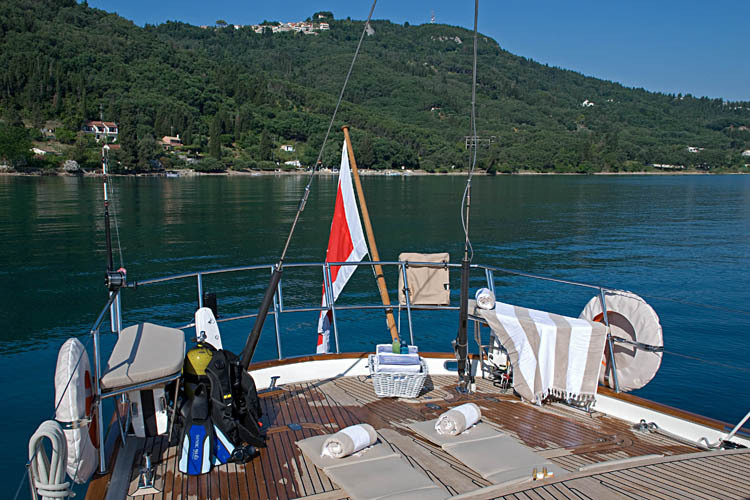 She has a professional and friendly young crew and is available in the Mediterranean for sailing yacht charters. The HANSEAT IV sailing yacht received a refit in 2012 with new soft furnishings in the upper and main salon as well as the cabins. She is looking better than ever. 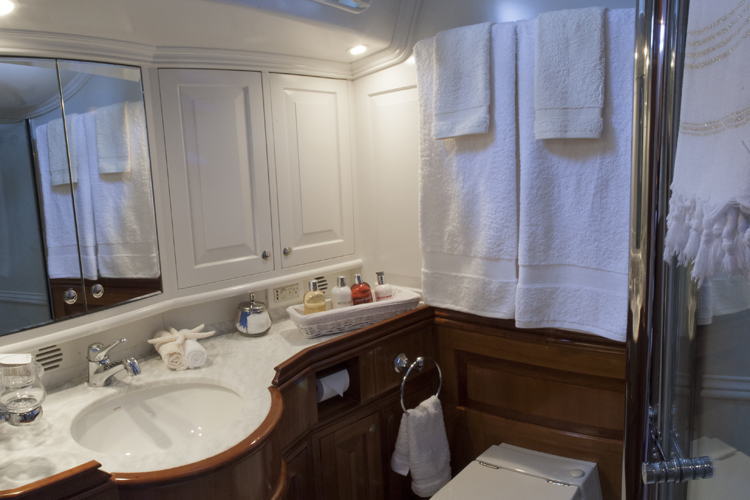 Yacht HANSEAT IV is able to accommodate 7 guests in one double master cabin and 2 double guest cabins (1 with Pullman berth).